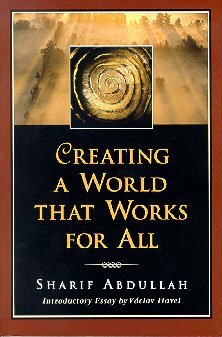 (The text of this website taken from "Creating a World That Works for All".) In his farewell address as Oregon governor, Neil Goldschmidt challenged his listeners to “name one hard thing your government asks you to do.” His question was rhetorical: everyone knew they couldn’t come up with an answer. If we are going to create a Mender society, we have to reject the pampered existence of the mall. We have to find that “one hard thing” to do. It may be work that is unpleasant and unpopular. But we will find that there are many, many others working beside us. I believe there are literally tens of millions of Menders out there. One of the reasons we do not recognize each other is that there is no common language, common symbology, common culture that unites us. The Mender Pledge is designed to change that. The Mender Pledge is designed to help us clarify our commitment, identify ourselves to each other, and mobilize enough people to catalyze a profound transformation of our society. I believe in inclusivity. I believe that our lives are inextricably linked one to another. We cannot wage war against anyone without waging war against ourselves. Therefore, I will practice inclusivity with myself, my family, my community, the natural world, and all others. I will actively work toward the goal of an inclusive society, a world that works for all. we are One. Therefore, I will give to you what I want for me. I know there is enough for all. everyone to win. Therefore, I will work to resolve all conflicts to every party’s satisfaction. I want acceptance. Therefore, I will accept myself for who and what I am, I will accept you for who and what you are, and I will accept all others for who and what they are. Even if I resist your behavior, I will accept you as a Child of God, a part of the Divine. I want no harm. Therefore, I will not harm myself or you or any others, by thought, word, or deed. I want forgiveness. Therefore, I will forgive myself, I will forgive you, and I will forgive all others. I want to be free. Therefore, I will not let others dominate, control, or manipulate me. And I will not dominate, control, or manipulate you or others. I want peace. Therefore, I will be peaceful with myself, with you, and with others. I want love. Therefore, I will love myself, I will love you, and I will love all others. I find it hard to do the right thing when people react to me out of fear or lack. At those times, I want to separate from them, see them as wrong or evil or just different. I want to defend myself. Then I realize that all of the discord, disharmony, and disease in the world comes from the futile attempt to defend against that which is within us. I will create bridges across our fears, our pain, and our illusion of lack. It may take several attempts, but I will succeed. And we all shall win.